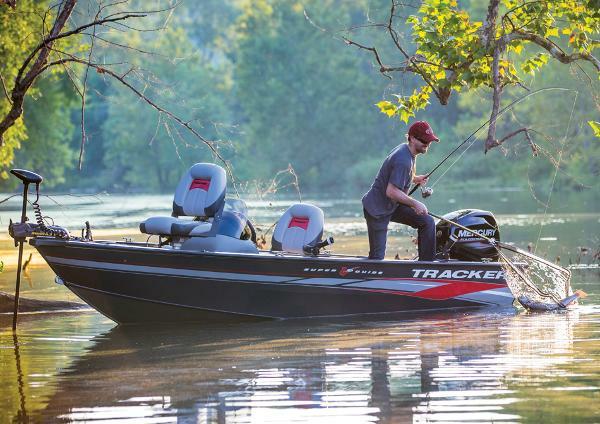 Whether you are ready to set sail for the islands or just around the buoys, the Hunter 36 can really make a difference. Starting with the tall, fractional rig, which is a direct descendent of the B&R rig that powered Hunter's Child to a second place finish in the recent BOC, Hunter has engineered the mast to carry less weight aloft with smaller sections. This is accomplished by utilizing swept-back spreaders and reverse diagonals as well as mast support struts. This combination provides superior strength without a backstay and increases the stability at the same time. 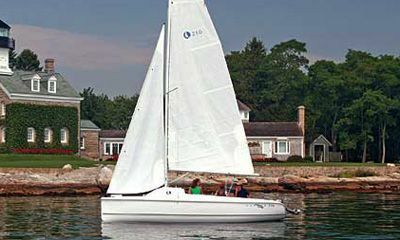 By using a large roach main as the power sail, Hunter has eased the effort in sail handling and allowed for real versatility for all wind and sea conditions. The deck layout reflects the innovation that accompanies the rig. An integrated arch protects the cockpit from snapping main sheets and blistering sun with the optional bimini. This arch keeps the cockpit clear and open. A custom console stands ready with the standard VHF and instruments. Single lever control and fold down table along with engine instrumentation complete the command station. The swim platform and walkthrough transom complete with shower and folding ladder are perfect for water sports or for boarding the tender. Storage is everywhere you look and the non-skid is absolutely first-rate. 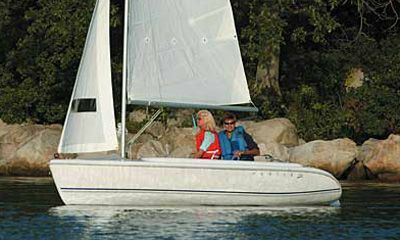 Manufacturer Provided DescriptionWhether you are ready to set sail for the islands or just around the buoys, the Hunter 36 can really make a difference. Starting with the tall, fractional rig, which is a direct descendent of the B&R rig that powered Hunter's Child to a second place finish in the recent BOC, Hunter has engineered the mast to carry less weight aloft with smaller sections. This is accomplished by utilizing swept-back spreaders and reverse diagonals as well as mast support struts. This combination provides superior strength without a backstay and increases the stability at the same time. 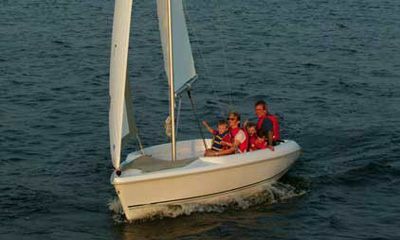 By using a large roach main as the power sail, Hunter has eased the effort in sail handling and allowed for real versatility for all wind and sea conditions. The deck layout reflects the innovation that accompanies the rig. An integrated arch protects the cockpit from snapping main sheets and blistering sun with the optional bimini. This arch keeps the cockpit clear and open. A custom console stands ready with the standard VHF and instruments. Single lever control and fold down table along with engine instrumentation complete the command station. The swim platform and walkthrough transom complete with shower and folding ladder are perfect for water sports or for boarding the tender. Storage is everywhere you look and the non-skid is absolutely first-rate.